Viewing topic "Sampling with Cubase ?" As the Yamaha MoDX and some other keyboards like the MOXF, MX etc don’t have sampling capability, can you sample on Cubase and edit the sample ? Recording and editing audio is one of the things one tends to use any DAW for, so the answer is yes. If you want to play your recorded audio back at different pitches, you would need a VST sampler. What VST sampler do you recommend for that purpose ? Sorry, I don’t personally use any VST sampler so my advice would be worth less than five minutes of Google. I know Kontakt is a popular one but please check it out yourself since it costs a bit. If you want to create your own waveforms for MoDX, then maybe just Audicity for recording and get the Melas software for the editing would be better? Thank you very much zpink. Just one last question if you wish to answer, in your opinion how powerfull of a sampler is the XF for you ? that if you have sample with it. 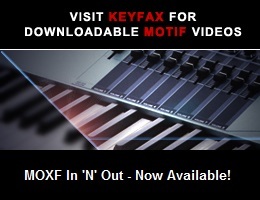 I have a MoXF, so no sampling on my Yamaha. I do have a Digitakt that I use for sampling, but that is more of a drum sampler, so no time stretch etc. Brilliant for percussion, sampled conversations and f/x though. I also realised, now when home, that I lied, I DO have a VST (and stand-alone) sampler on the computer too. Maschine, but that’s not a bog standard sampler neither. What is it you’re planning to use your sampler for?